PRIVATE/PUBLIC PARTNERSHIP. NASA wants to stop relying on Russia to get American astronauts to the International Space Station (ISS). And little by little, SpaceX is making that happen. SAVE THE DATE. 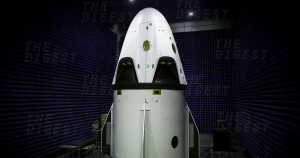 On Thursday, NASA announced that SpaceX’s Crew Dragon (its spacecraft designed to transport astronauts) will be ready for an uncrewed test in November 2018 and a crewed test in April 2019. Boeing’s comparable CST-100 Starliner, meanwhile, will be ready for an uncrewed test in late 2018/early 2019 and a crewed test in mid-2019, according to NASA. ISS OR BUST. This delayed timeframe isn’t entirely unexpected. In July, the Government Accounting Office (GAO), an independent agency that investigates federal spending for Congress, released a report predicting that SpaceX would complete its certification process in February 2020; Boeing is likely to wrap it up a month earlier.